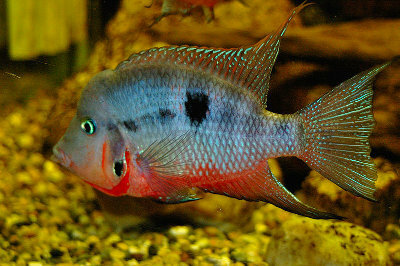 The Firemouth is formally called the firemouth cichlid. Its species name is Thorichthys meeki. The species is called the firemouth because of its bright red bottom colors, especially around the gills and mouth, during breeding season. This contrasts with the bright blue on the rest of the body except for a few black spots or blotches. When the species isn’t breeding, it has a more muted red and blue coloring. Males are brighter than the females. Males will flare their red gills in a thread display to drive away competitors. The Thorichthys meeki is native to rives in the Yucatan, in Mexico. They are also found in some rivers in northern Guatemala. The firemouth grows up to six inches in length, but most specimens are around two inches long. Males are larger than the females. They should be kept with other fish of similar size. They live best in water that is 70 to 75 degrees F and has a pH of 6.0 to 7.5. They need water with a hardness of KH 4-10. The species is semi-aggressive and gets even more territorial during spawning season, when their colors light up. This means they need a large tank. They need lots of sand to burrow in. Plants in the tank with them need to be hardy, ideally in pots that protect the roots from damage due to burrowing. The species lives in slow moving rivers but has been reported in underwater caves as well. During spawning season, the fish will pair up to breed. Unlike some fish, the Firemouth won’t eat its eggs. Both parents care for the fry. The male tends to protect the territory while the female protects the young. The breeding pair may produce several batches of eggs each year. Firemouth fish eat flake fish food, cichlid pellets, plankton wafers, bloodworms, tubifex and most other fish foods. They cannot extend their jaws very far, so they rarely hunt down prey.